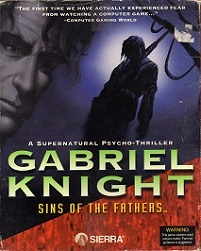 Gabriel Knight: Sins of the Fathers is the novelization of the 1993 adventure game by the same title by Sierra Online. It was also written by the game designer, Jane Jensen, in 1996 and first put into print in February 1997. The novel was also included in the US release (and possibly EU release?) of the Gabriel Knight Mysteries collection, published in 1998.